This time last weekend I was at Brisbane Supanova having a fantastic time. 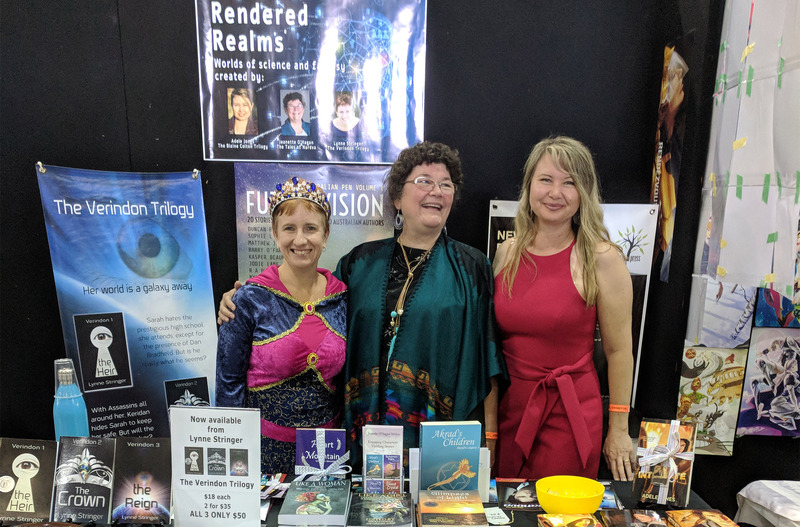 I attended with my good friends, Adele Jones and Jeanette O’Hagan, occupying the Rendered Realms stall. It was a fantastic weekend with a lot of good chats, a lot of compliments for people wearing great costumes, and thankfully, a good number of sales. Of the three of us, I think Jeanette sold the most. People couldn’t get enough of her fantastic fantasy books, which you can see here. As usual, Adele impressed with her knowledge of science, included in her entertaining Integrate trilogy. Click here for more about her books. And much to my delight, after five years of trying, I broke my record for the most books sold at one event, with 19 books sold overall. It was wonderful to finally break this record. I’m not going to kid myself into thinking that it’s going to happen every time, but hopefully, especially as I have more new releases (which I hope will happen soon) I will continue to build on that number. Glad it went well Lynne. Looks like you’ve all found your tribe. Great costumes too. I’ll have to get to Supanova next year. That’s terrific. Here’s hoping it’s a catalyst for even greater success. Congratulations to you, Jenny and Adele, Lynne.